The blue shark is the only shark present in the Prionace genus and it belongs to the Carcharhinidae family. This shark is one of the few known to be practically diffused in all the moderate, tropical and subtropical seas of the planet, in pelagic waters but also coastlines. 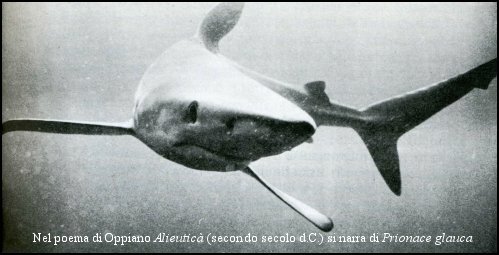 (this animal was already well known in antiquity, in fact in the second century d. C. the Greek Oppiano wrote the poem Alieuticà, where the author talks also about the shark Prionace glauca). The blue shark can reach 190 m of depth even if some surveys on the habits of this shark, in proximity of the coasts of Brazil, show that this animal can come to overcome the 350 m dipping himself to the search of backdrop preys. It seems that for the 35-60% of the time the blue shark swims to smaller depth of 50 m, for 10-15% to greater depth of 150 m.
The blue shark suits for very various temperatures, from 6 C° to 28 C°, even if the optimal temperature is among the 8-19 C°. Currently there aren't complete studies on the global course of blue shark population, but it is probable, seen the elevated number of captures, that is in action a meaningful reduction of this animal. 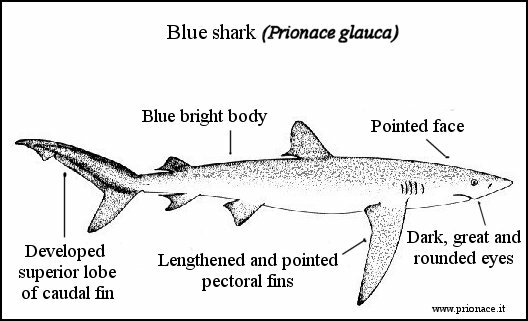 The morphology of the blue shark is unmistakable: the body of this shark is of color blue indigo, almost bright, the sides and the tail are blue-grey, while the abdomen is of a very marked white. The face has lengthened and pointed, the eyes are dark, great and round, endowed with nictitating eyelids. The pectoral fins are lengthened and pointed, the caudal fin is very developed in the superior lobe, that can reach 4 times that inferior. The blue shark is potentially considered a dangerous shark for the man, even if in the "classifications of the dangerous sharks" it results among the last places. Is the curiosity of this fish, toward what it happens around him, that can make to approach him and to create risky situations, even if not provoked attacks are rare. It seems that this shark is more docile and calm during the day, while in the late afternoon, when in water the brightness decreases, it becomes more curious and tenacious also approaching himself to the coasts. 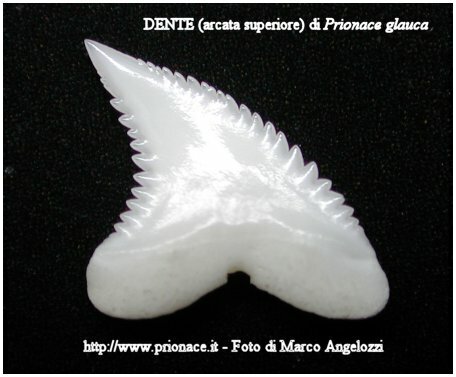 The teeth of Prionace glauca are small, pointed, slightly bent and serrated in the arcade superior, more narrow and astute in the inferior arcade. The blue shark is able of to reach elevated speeds in water but he normally stirs with walk a lot of redoubt, smaller of 2 km/h, and he doesn't even love to chase particularly fast preys. This shark is present in great number when there are great quantities of food to disposition as afloat carcasses of whales and rests (always of sea mammals) while during the other moments of his life is a rather solitary animal. The diet consists of: cefalopods (cuttlefishes and squids), small fishes (also of backdrop), invertebrate, eggs of pelagic fish and sea birds. During the periods of reproduction of the squids, for example in the nights without moon of February, around the coasts of the island Catalina, California, it happen the so called "night of love and death".. Thousand of squids reunite for finishing their only year of life with the reproduction and the deposition of the eggs and the blue sharks are always present to take advantage of this enormous quantity of food. In the myriad of cefalopods in reproduction the open jaws of the blue shark appear from the dark of the night and they slowly move, capturing without apparent effort a lavish meal.. The blue shark is a shark that completes great migratory movements, commonly covering the 3000 km coming to overcome the 6000 km. The principal moves are taken place every year through the Atlantic ocean, following and exploiting the Tide of the Gulf, in a circuit that departs from the Caraibic seas, along the coasts of the United States up to the coasts of Europe, going down then thin in African waters to complete the circuit returning toward the Caraibic seas. This shark often swims in great groups, formed only from male samples or females, of the same dimensions, and is not known he anchors the motive for this behavior, conflicting with the solitary nature of the animal.. The blue shark has a viviparous reproduction with placentata, with a pregnancy that can last 9-12 months. During the birth the small ones can go from a number of 4 up to 135 (even if in average they are 50-60) with a length of 35-50 cm. The number of the small ones grows in base to the dimensions of the female that gives birth to them. In some areas has been observed that the reproduction of the blue shark is seasonal, with the birth in spring and summer, even if in reality the females of this shark can maintain the vital sperms of the male inside the body for prolonged periods. 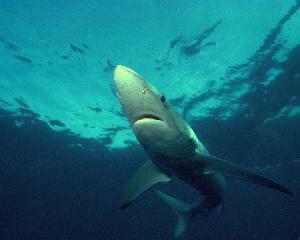 The blue shark become mature to 4-6 years of age and a middle length of 250 cm. The reproduction moments are very bloody. In fact the male repeatedly bite the female and seems that without this behavior the reproduction cannot be completed. During these very delicate moments the female can risk injuries and lacerations. Probably to avoid these risks the skin of the female exemplary of Prionace glauca is three times thicker than that of the males. The blue shark would seem to be able to reach the 20 years of life, but as already mentioned, because of the elevated captures from the man, it is not known if the world population of this shark is drastically (as it is probable) decreasing.. The adult samples of blue shark have few natural raiders: greater dimensions sharks (above all white shark, Carcharodon carcharias and mako, Isurus oxyrinchus) and the orcas. Sicuri come l’uccellino nel suo nido muschioso. Rinchiudono nelle bocche spalancate i loro piccoli. Le forme massicce avanzano nella marea crescente. Tutte le specie ovipare che affollano i mari. Tengono d’occhio ogni onda, rivelano la via incerta. Insegnano dove cacciare e dove trovare la preda. Li espelle a forza dal loro piacevole riposo.